External Structural Damage – When your gutter becomes clogged, water will accumulate inside them that can result into numerous problems. First, the gutters themselves will suffer from the sheer volume of the accumulated water and dirt inside that can eventually damage them beyond repair. Secondly, when the gutter overflow, the water then looks for another way to go down the drain. They will then continue down the sides of the walls. Water will seep through and start to weaken the materials. This will eventually show visual damage like cracks and discoloration. Lastly, the ground around the house will be soaked too. This can then weaken the foundation of your house itself. This is the worst thing that can happen since the house’s integrity mostly relies on its foundation. Internal Damage – Aside from the external damage that poorly maintained gutters cause, there are those that happen in the inner workings of your home. Water will seep through the walls that can cause cracks. These cracks will only get bigger and bigger. These cracks are also an ideal place for pests like rats and cockroaches to flourish in. In addition that, wirings can also be damaged by the water. This can cause faulty electric lines, phone lines, and many more. Molds and fungal growths will be prevalent too since your home will be have damp surfaces. And that’s all because of your house gutters. You will also see water damage on your ceilings as water leaks from your roof. You will notice that your ceiling will weaken and sag. 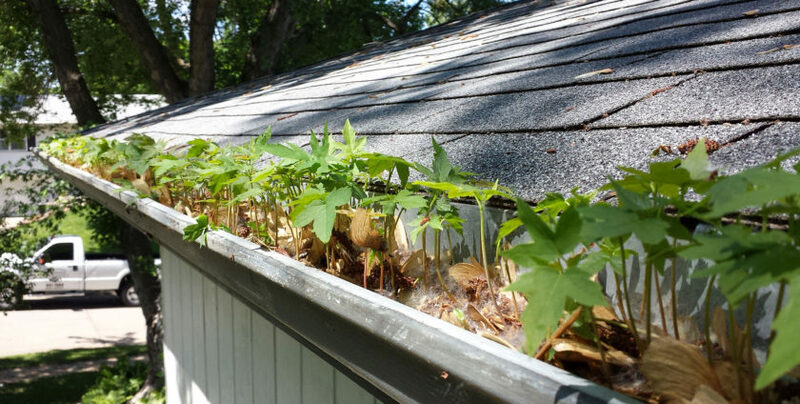 There are no good things that can come from poorly maintained gutters. Insurance companies will be less likely to grant coverage for damage. So cleaning out gutters and gutter maintenance from time to time is necessary to avoid those gutter problems that ends up needing a complete exterior services.